Cars and women, two things men love. Men love cars so much, the go as far as naming their automobiles with female names, referring to the car as a “she”. Taking that into consideration, the concept of this campaign is to use the new CTS-V as a woman, her name, “V”. It is “V’s” job to intice the consumer into buying “her”. Cute little notes from “V” will be printed on loose leaf paper, folded in half, and inserted into various magazines, newspapers, and other forms of print. An example of what one of the notes will say: “If you can catch me, you can have me. Kisses, V”. There will be no connection/inclination to the Cadillac brand during this stage of the campaign. Mulitmedia advertising will include Cadillac vehicles from recent years strategically place around major cities, with a message written in lipstick on the windshield from “V”. 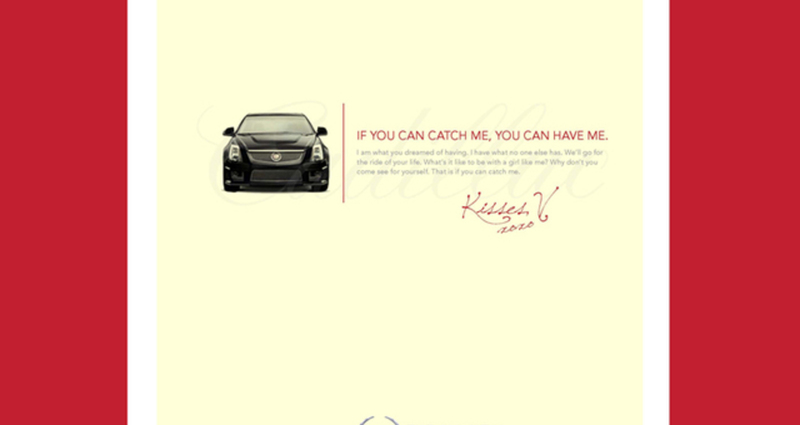 Ads will be run in print, outdoor, and multimedia introducing the consumer to “V” as the Cadillac CTS-V. It isn’t until after these ads have been introduced will the commercials be released.